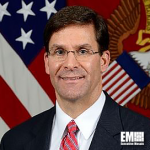 Army Secretary Mark Esper has said the service has begun to evaluate programs that could be slowed down or eliminated in order to funnel funds into its top six modernization priorities, Breaking Defense reported Thursday. Those modernization priorities are air and missile defense; artillery; networks; soldiers; armor; and aviation. “We have to do our due diligence… And it’s going to mean cutting programs, freeing money from current programs by either slowing them or killing them, whatever the case may be, to free up money for those higher priorities,” Esper, a 2018 Wash100 recipient, said at the Heritage Foundation Thursday. He noted that the Army has started to take a look at more than 800 acquisition programs under the new review and will assess each of those initiatives based on individual merits. The U.S. Air Force released the results of a cross-functional team effort testing approaches to gain and maintain superiority in the electromagnetic spectrum. USAF commenced the effort in January 2018 and announced the results in January 2019 during the Weapons and Tactics Conference at Nellis Air Force Base in Nevada, the service branch said Tuesday.